The full story of the Battle of Britain's highest scoring RAF ace, told for the first time. It reveals the man behind the legend, uncovers his legacy, dispels myths, and analyses open questions. This is the definitive account of the short life of this very brave young man, and cements his place as one of Britain's true national heroes. In early 1939, 19-year-old Salopian Eric Lock joined the RAF Volunteer Reserve to fulfil his dream of flying. Within eighteen months, he found himself pitted against one of the largest air forces in the world, fighting for the survival of his homeland in a pivotal battle that, if lost, had the potential to change the course of world history. As his training was not completed until after the Dunkirk evacuations, he was not posted to his first operational unit, 41 Squadron, until late June 1940, just prior to the commencement of the Battle of Britain. Displaying a natural aptitude for aerial combat in his Spitfire, a number of spectacular victories quickly ensued and Lock became an Ace within four weeks of his first operational sortie. For a period during September 1940, he even maintained a 100 per cent strike rate: one victory for every operational sortie he had flown. In mere weeks he rose from anonymity to become a household name and hero of the nation. He was awarded a Distinguished Flying Cross in September 1940, a second in October, and a Distinguished Service Order in November. Ultimately, he claimed twenty confirmed victories during the Battle of Britain, and was the top-scoring RAF Ace of the campaign. However, it did not come without a price and Lock was seriously wounded in action in November 1940. Hit in three limbs by rounds fired from a German fighter, he spent the ensuing six months recuperating, and underwent three skin grafting operations performed by gifted plastic surgeon Sir Archibald McIndoe. Lock returned to front line operations with 611 Squadron in summer 1941, but sadly failed to return from a routine patrol to France just six weeks later. 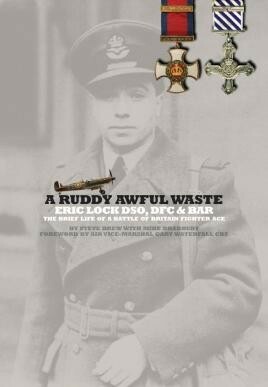 A Ruddy Awful Waste tells Eric Lock's full story for the first time. It reveals the man behind the legend, uncovers his legacy, dispels myths, and analyses open questions. We witness his highs and his lows, we feel his joy and his pain, and we grieve with his family as they struggle to come to terms with his loss. This is the definitive account of the short life of this very brave young man, and cements his place as one of Britain's true national heroes. In teaming up with the excellent publisher Fighting High, a quality product has been achieved and we have no hesitation in making this our Book of the Month. Fighting High have always been about honoring the people who appear in their books, and this one is no different. The authors have resurrected one of the greats and made him real. We really can't hope for much more than that, can we? Had he lived, there is little doubt that his story would be known backwards by now and in its umpteenth printed edition. One can but hope that this becomes the case with this book. This is the definitive account of the short life of this very brave young man, and cements his place as one of Britain s true national heroes.